These cookies might not scream 4th of July but once you bite into one, I don't think that you (or your guests) will mind too much. Sometimes my love for scrumptious names leads me down a blithe, non-hat wearing, path. How could I possibly resist a recipe called Mezzaluna? (Which means half-moon in Italian.) Just saying the word "mezzaluna," makes me feel like I'm on the Amalfi coast surrounded in a Maxfield Parrish-like ambiance...rusted champagne cocktail-colored hair blowing in the breeze. Even though this recipe may look a bit daunting at first, I promise that it's not too dramatic. Technically they're not cookies, but calling them cookies makes the recipe sound more accessible and friendly. 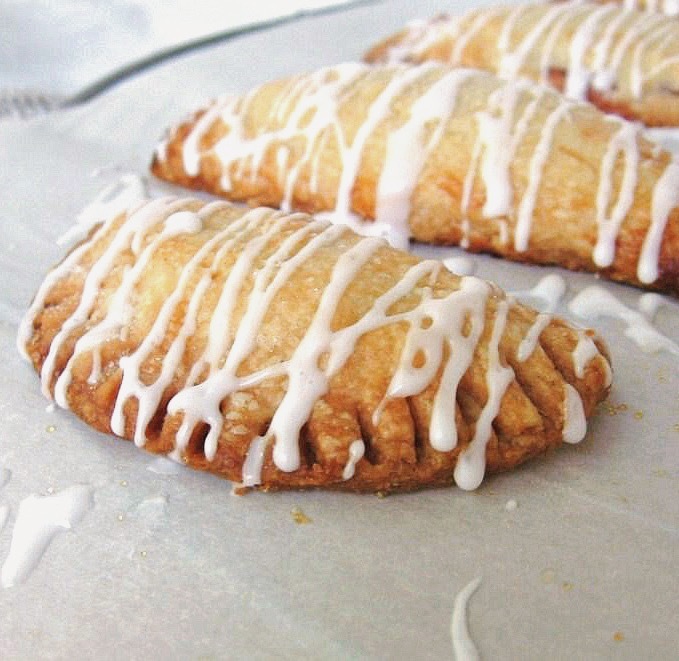 (You may summon the title of pseudo hand-pies...just smaller, flakier versions.) The dough is basically an all butter shortcrust pastry. Once you've lovingly rolled it out, you cut out tiny rounds, fill them with puréed strawberries, fold them over and pop 'em in the oven. Not too complicated, right? "I've never had anything so flaky and tender!" Said someone who should have known that this would be a stab in the heart to all my apparently soggy pie crusts. (They're kind of right though.) These cookies are unbelievably buttery and rich and precious with their little fruit-filled centers. My only advice would be to avoid rolling out the dough on a humid day. I had a few issues with my dough sticking to the work surface, but my kitchen is insanely warm. If you run into problems, just pop the dough back in the fridge for a few minutes + don't be shy about flouring the work surface. *If you don't have any pastry flour on hand (who does? ), whisk together 1 1/3 cups of all-purpose flour and 2/3 cup of cake flour. This makes 2 cups of pastry flour, so just be sure to measure out the 1 1/2 cups needed for the recipe. (Set the remaining 1/2 cup aside for another use, or for flouring the surface. Place the flour, sugar, and salt into the bowl of a food processor. Pulse a few times to combine. Scatter the bits of cold butter on top and pulse several times until the mixture resembles coarse meal. Sprinkle on the almond extract and ice water, and pulse just until the dough starts to come together. Try not to over-mix. (It should hold it's shape when pinched.) Dump the dough onto a floured surface and gather it into a ball, kneading just enough to incorporate any crumbly bits that may have escaped the blade. Pat the dough into a disk, wrap it up in plastic, and refrigerate for at least one hour. Place the rounds on the prepared baking sheets, leaving about 2-inches of space between each one. Brush the edges of the rounds with egg white. Spoon 1 teaspoon of the puréed berries (or jam, if using) onto one half of each round. (Be sure to leave about 1/4-inch of bare dough between the puree and the edge of the cookie.) Fold the empty half of dough over the strawberry-filled half, and gently pinch the the edges together...the egg white will help make them stick. Use a floured fork to seal everything together. Repeat with the remaining dough. The scraps can also be re-rolled, just be sure to refrigerate them before doing so. Don't toss out the egg white just yet. Once all the cookies have been filled and folded. Place them in the refrigerator for about 15 minutes. Divide the oven into thirds, and preheat to 350 F.
Remove the cookies from the fridge and brush each one with the egg white. Sprinkle with the granulated sugar. Bake in the upper and lower thirds of the oven for about 40 minutes, or until golden brown. Switch the pans halfway through the baking time. [Note: My cookies were ready after only 35 minutes, so be sure to keep a close eye on their colour.] Remove the pans from the oven and carefully transfer the tender cookies to a cooling rack. Cool completely before serving. 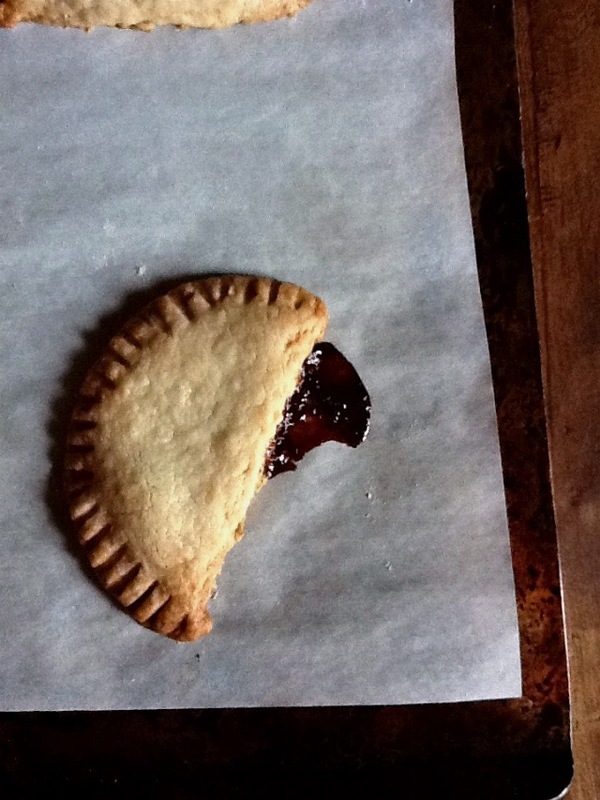 Sprinkle the Mezzaluna cookies with sifted confectioners' sugar, or a simple glaze. Whisk together the sugar and cream until smooth. It should be thin and drippy, if it's too thick, add about 2 more Tablespoons of confectioners' sugar. 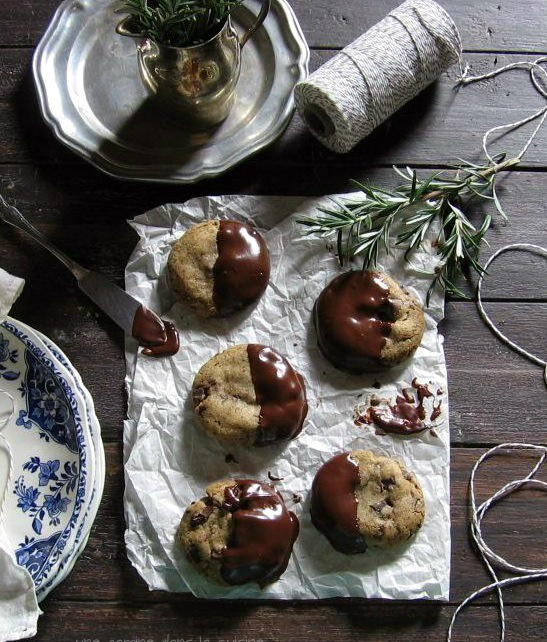 Use a fork or a small whisk to drizzle the glaze over the cooled cookies. Oh my, these look like poptarts on crack!! Fabulous! 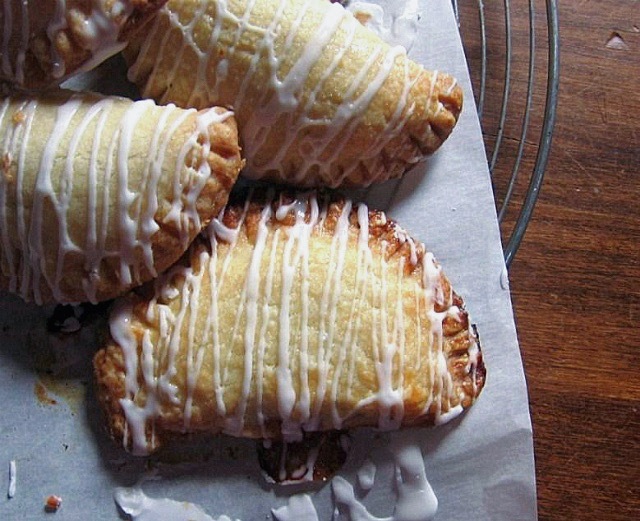 I love handpies. Strawberry fillings are su delicious. I'm all for a mezzaluna that will transport me to Amalfi! :) Love, and the strawberry filling is perfection! Buttery and rich and full of fruit. How could I say no? Gorgeous work, as always. I hope you have a wonderful 4th of July! I would make these for the 4th of July in a heartbeat! I just got home after going out for a big dinner but I still wish I had one of these beauties! i love the word mezzaluna :) these look absolutely delicious! I made these and although I did not put anywhere near enough strawberry filling in each cookie, the crusts were delicious. With a heftier dollop of strawberry, however, they would have been really wonderful. As it was, they were quite addictive:) Thanks for the recipe.